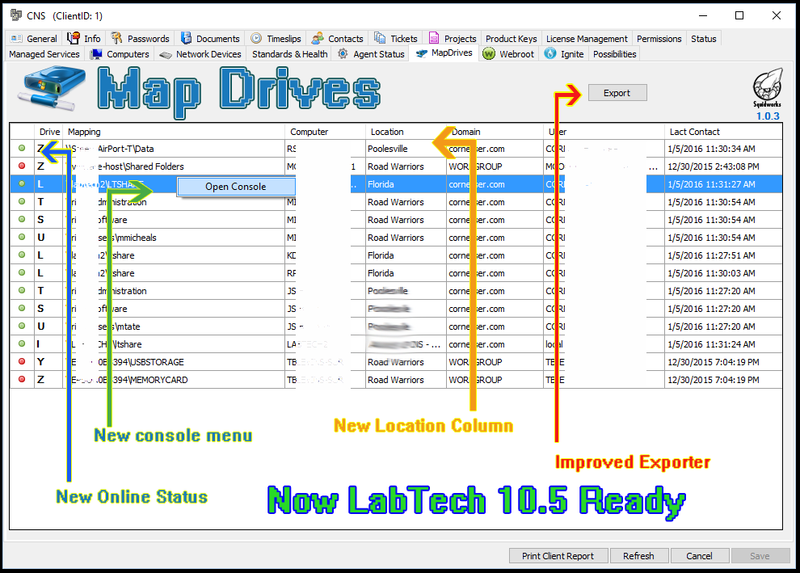 LabTech – Map Drives plugin shows you mappings by client. Ever wished you just could see everyone’s mapped drives at one time so you could see who had what mappings and where they went? Me too. Well now in LabTech there is a plugin for that! Squidworks has created a new plugin that fetches all the mapped drives for all systems under a given client and displays them in a nice list that has sort-able columns. What is a Drive Map Plugin if it can’t map drives? Map both drive letters to network shares or Printer ports to Network printers with this simple tool. Right click on a listed system in the Map Drives plugin and select the menu option to Map a Drive. We now added the ability to export the mappings to an Excel spreadsheet. Improved the export the mappings to an Excel spreadsheet. Super-easy to install and works like a charm. Another awesome Labtech plugin from SquidWorks. Thanks guys! Glad to make something useful to Engineers. I downloaded this plugin. I didn’t install it yet. Is it supposed to be a .dll file? or an .exe file? If its a .dll file, is there a specific path that we need place this file in? Then you use plugin manager under the help menu to install the DL. You will need to reload your console and some times you have to re open plugin manager and re check the plugin to get them to activate. Then look under the client console for a map drives tab. Confirmed working in LT10. Thanks Squidworks! This plugin is working great but the ‘Export’ button doesn’t seem to work. Is it automatically saving the spreadsheet somewhere or should it be prompting me? It usually places the exported files c:\temp. just checked- nothing there either. I’m sure I have three or four hundred of these somewhere haha- any idea what the output file is called so that I could search for it? Anyone having luck with this exporting a spreadsheet? Can’t seem to locate the film if mine is in fact exporting anything. I’m in LT 10. I was wondering if you can provide me with the name of table for this plugin? Also, I got a tab in View >> MapDrives . but It’s empty. It happens to me only ? Really helpful, as a feature request, can we have a mapped drives tab on the location screen as well? Thanks for some great plugins. I’m having trouble with loading the mapped drive plugin. When I try to add it in the Plugin Manager I get an error “There was an error uploading the new plugin” Only other example I found on this error was somebody with a .Net problem. Does this require a certain .Net version? We are on LT 10.5. It is a security issue with DLL. Right click DLL and select properties, click the “unlock” button on properties window. Then try install of plugin. Never mind. Closed and reopened control center and it let me install that time. Working far as I can tell. How do you force the list to update? We recently removed a server and replaced with a new one. All the old mappings are still showing. Many of them we know have been removed, but we want to check for any we may have missed. Are there plans for an update for the 11.0 release? I tried adding it but does not show up as a tab. Update: I was looking under the end points and the tab shows under the client setup (as the first screenshot shows). A console # represents the user who is logged on, Console 0 is normally the directly logged on user of that PC. This is how you map a drive to a user and you will need to provide their account creds or creds that are able to access share. Attempted to install the plugin with the latest patched LabTech 11 version and receive an error when trying to add the plugin via the Plugin Manager. I am not sure if this works anymore with the latest patch? Amazing plugin, does what it says it will do. Moving to a new file server, couldn’t trust GPO or scripts on who had what drives, this allows me the added visibility I needed. I am trying to use the Map Drive plug in, but every time i tried to export it shows Excel export went south, Sorry! – Input string was not in a correct format. When you right click and “Map Network Drive,” does it apply the mapping to all PCs, or just the Computer on the row you’re clicking on? What credentials does it use to map the drive if you don’t specify any?